I know, cleansers aren't the sexiest of all the skincare world, but they're most certainly essential. The clear the canvas (so to speak) for the other products to get to work, and really, is there a better feeling than a freshly washed face at the end of the day? I'm a pretty devout Vichy fan, but the new Pureté Thermale cleansers in my life have made me an extra happy fan-girl. 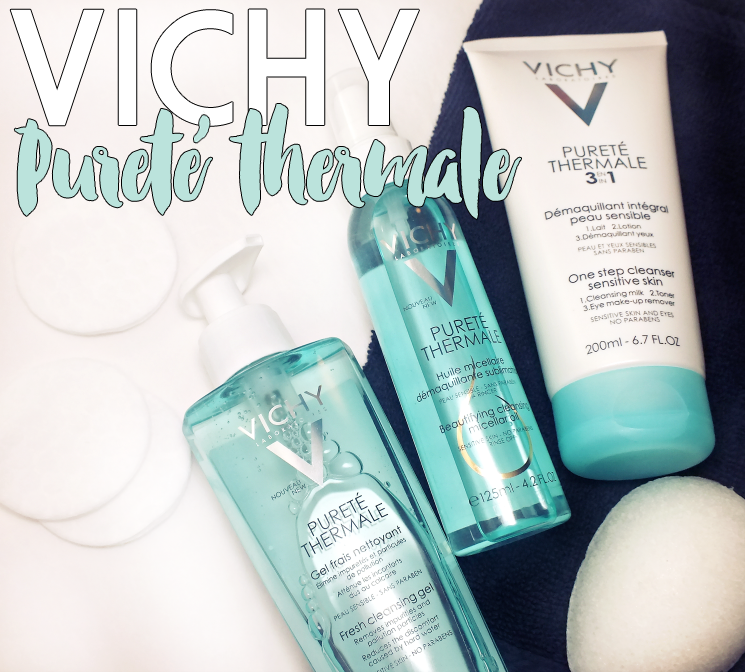 Read on for a look at a brand classic, and two all new additions to the Vichy Pureté Thermale family. 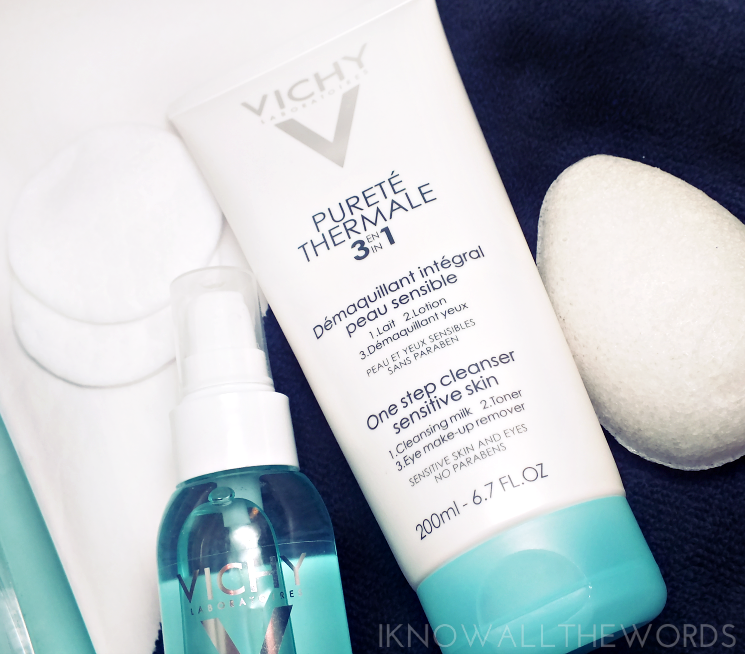 Vichy Pureté Thermale 3-in-1 One Step Cleanser is the best selling cleanser in Canadian drugstores (and has a worldwide following.) One use and it's obvious why so many love it. The milk-gel texture breaks up all makeup, cleanses skin, soothes even the most sensitive skin types, and acts as a toner to boot. Not shabby at all. The lotion isn't meant to be washed off- you wipe the excess away- yet skin is left perfectly clean and comfortable feeling. As all Vichy products are, this is formulated with Vichy Thermal Spa water and is paraben free, hypoallergenic, and non-comedogenic. 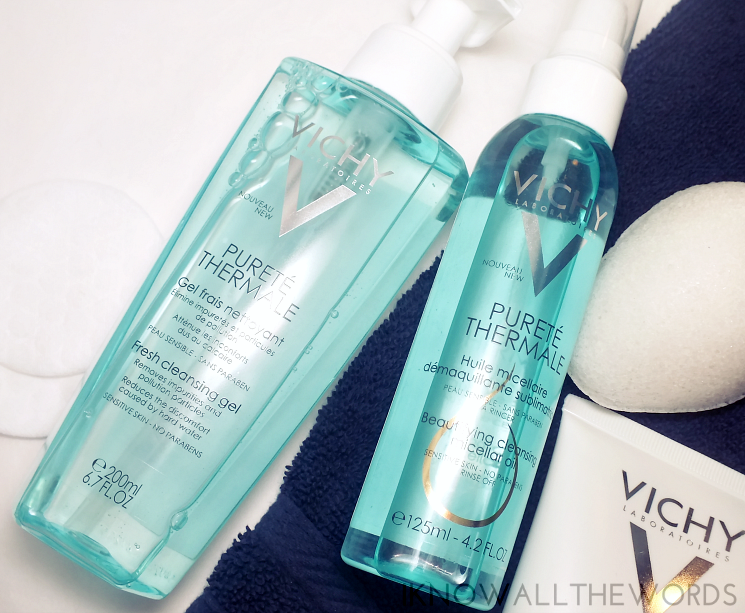 As for the new Pureté Thermale additions, there's Vichy Pureté Thermale Fresh Cleansing Gel. Hold on, don't skip over this part because it's a cleansing gel. They often get a bad wrap, especially amongst those of us with drier skin, but this one is completely different than anything I've ever used. The crystal clear gel has a light texture that transforms into a luxe, squishy feeling, milky gel. It's hard to describe, okay? The gel doesn't foam in the typical sense, but leaves skin feeling micro-clean, but comfortable and not the least bit dry. Plus, the light, fruity scent is quite nice. The formula features Purisoft (moringa seed extract) and citric acid which aids in combating and neutralizing the effects of impurities on skin (like pollution particles, dust, and excess sebum) while limiting discomfort due to hard water. Ooh, while on the topic of hard water... Did you know micellar water was originally created in the 90s to help Parisian women deal with the region's notoriously harsh water? The same water that makes the famously amazing French bread all crusty and delicious doesn't do your skin any favours. And that unplanned anecdote brings us around to micellars, which play a part in Vichy Pureté Thermale Beautifying Cleansing Micellar Oil. Sounds a bit like some sort of skin care lovechild, which it kind of is. The formula combines micellar technology to gently give makeup and impurities the heave-ho, and camellia oil to improve skins' softness, radiance, and smoothness. The oil has a light, water like texture (aka it doesn't feel oily) that emulsifies into a milky cleanser. The oil rinses away completely, leaving oily film or stickiness and skin feels soft and fresh. I love that this is able to cut through waterproof formulas (bye bye, mascara!) without much effort and doesn't require excess rubbing or tugging. Overall, you really can't go wrong with any of these cleansers. While I do love my cleansing oils, I'm tempted to say that the Fresh Cleansing Gel is my favourite of the pack. The texture is just so perfect and it leaves sin so completely clean. Tried any of these cleansers? Do you have a favourite Vichy product?